A typical restaurant kitchen has a layout featuring several different stations. A station is a designated area where a certain type of food is prepared. 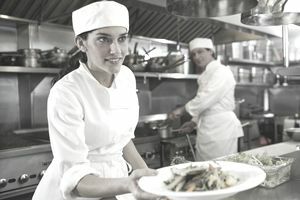 Stations help keep a restaurant kitchen running smoothly. The number of stations in an establishment depends on the restaurant’s menu. One restaurant might have several stations with specialized equipment, while another might have just one or two areas that are designated for cooking certain menu items. As fine hotels — including their fine restaurants — became more common toward the end of the 19th century, commercial kitchens had to scramble a bit to catch up with the trend. The brigade de cuisine was born, which is effectively a nice, French way of saying the "kitchen staff." The mother of all brigade de cuisines might be the one that's credited with being the first, created by Chef Georges Auguste Escoffier in the later 1800s. His included more than 20 cooks and dozens of other staff to ensure that everything ran smoothly. But the term "staff" doesn't really do a kitchen brigade justice. Some of these professionals are highly trained and accomplished chefs, while others might simply be learning the ropes, perhaps placed in charge of creating salads. Some might man a single kitchen work station, whereas others oversee the entire kitchen operation. Kitchen brigades have decreased in size over the last century as technology has advanced, allowing fewer people to do the same work that once required multiple hands. Think of food processors when chopping and dicing were once painstakingly accomplished by hand. And restaurants tend to be smaller and more intimate these days than the grand establishments of the 19th century. But a chain of command still exists, and meal preparation is still sorted by stations in most establishments. The most experienced cooks tend to work the sauté station because this is where the most complicated dishes are prepared. A sauté cook must be skilled enough to cook several dishes at once during the dinner or other rush hours. In an extensive kitchen brigade, you might find the saucier here, the chef responsible for creating the sauces that accompany some dishes. Sometimes the saucier will also serve as the sauté cook, responsible for sauces as well as all sautéed or pan-fried entrees. A sauté station is typically equipped with a multiple-burner gas range, sauté pans and tongs. It usually has its own prep area with all the cook’s necessary ingredients, as well as a cutting board, cooler, and seasonings. The grill can be a charbroiler or a flattop, and the grill station also usually has a cooler for grill items such as chicken, beef, or kebabs. You'll also find tongs and a grill brush here, along with whatever house seasoning you use. The grill cook should also have a great deal of experience. Like the sauté cook or saucier, he's often cooking several dishes at once. He needs to know how to properly cook beef to well, medium, and rare temperatures, as well as fish and poultry. The fryer — or fryolator as it's sometimes called — is for foods like chicken wings, onion rings, and French fries. A great deal of food that goes into a fryer is frozen, so most fry stations have their own freezers. Other necessary equipment includes fry baskets, tongs, and bowls for breading. The fry station is a good entry-level cooking position, ideal for someone just starting out in a restaurant kitchen. But one individual might assume the roles of both grill cook and fry cook in some kitchen brigades, particularly in smaller kitchen establishments. If pizza has a prominent place on your menu, you'll need a pizza station. A combo reach-in cooler with a prep area is a good choice for a pizza station. And, of course, you'll need an oven. You can invest in a specialty pizza oven or use the ovens in your gas range. A large oven that can cook several pies at once is your best bet if pizza is the focal point of your restaurant and you plan on serving a lot. A well-stocked pizza station should also have pizza screens for cooking and serving, a pizza paddle, pizza cutter, and sheets of wax paper. The pizza chef is also often an entry-level position. There's room for advancement from here. Restaurants with enough space might add a salad station or a dessert station as well, or these might be incorporated into the wait station. Many modern kitchens include a garde manger position here as well. The garde manger, often a cook rather than a chef, creates salads as well as cold appetizers and might plate some desserts as well. The garde manger position can be much more advanced in larger, busier kitchens, however, and might be entrusted to create and oversee a wide range of chilled or cold dishes and even ice carvings. A chef typically mans this area. A well-stocked salad station includes coolers for lettuce, vegetables, salad dressings, and plates. A dessert station should have a cooler for deserts and spaces for plates and dessert forks. It should include an area to assemble the desserts. Last but certainly not least is the kitchen line, the area where the servers pick up their food, although “the line” sometimes refers to the line of stations in a kitchen. It's often manned by the expeditor — the individual who's responsible for sending dishes to the dining room looking great. In larger kitchens, the expeditor might also communicate the waitstaff's orders to the cooks in the brigade. The line should have garnish, plates, a spindle for order tickets, and heating lamps to keep waiting food ​hot. How Many Stations Will You Have? Budget, space, and your planned menu are the biggest considerations in determining how many stations your kitchen will need. Many of these can be combined to save space and money, and you certainly don’t need a cook at each station during slow shifts.